Made from rustic argillite, a fine-grained, durable sedimentary rock, quarried in western Montana, Montana Antique Ledge Stone offers rich textures and an energetic color palette that can work well with any style of architecture. Browns, rusty reds, and bright golden tones provide a vivid contrast to the dark grey cores in this natural stone veneer product. Both builders and designers will find it easy to mix and match it with existing materials like wood trim and siding. Stones are laid in the traditional style, in the roughly rectangular ledge stone shape. This beautiful veneer ranges from 2" to 8" face heights and 3" to 18" lengths. 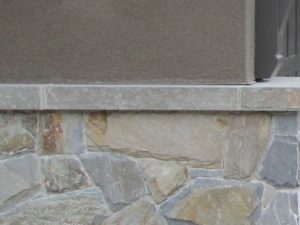 Used on the outside of a traditional, modern or contemporary style home, Montana Antique Ledge Stone adds character and warmth. Apply the stone to half walls and use it to highlight the angles of eaves, window trims and other architectural features. Used across separate areas or buildings it creates a harmonious linear flow. Apply it to columns, porticoes and around the front door for a striking front entrance. This product can also anchor a back yard landscaping plan by adding definition to planting beds, retaining walls and outdoor living spaces and kitchens. Inside, Montana Antique Ledge Stone is a warm and interesting material to use around the fireplace, making it a focal point, or by extending it to the ceiling, as a dramatic feature wall. It can play up a rustic, cottage inspired decor, or add dimension to a sleek and minimal modern interior, drawing the eye and emphasizing straight lines and angles. It is also effective when used to enhance small or transitional spaces such as foyers, stairwells, landings, bath and powder rooms. For adding value, beauty and warmth to the indoor or outdoor rooms of your home, it's tough to beat the return on investment of natural stone veneer products such as Montana Antique Ledge Stone.